I think presents are a pretty big part of Christmas traditions for everyone, but certainly one worth noting. My Christmases have always been filled with gifts. They flow from under the tree like two giant waves: my gifts on the left side of the tree, my sister's on the right, and we used to open them wearing matching pajamas. One particularly precocious year, perhaps my sister's first, my mother asked me on video camera what I thought of Santa. "I think Santa has the same wrapping paper we do!" My parents, who are wonderful at all times of year, really shine at Christmas. My father's crazy lights, my mother's amazing cooking, and their dual ability to know what we want and get it, even when we give them lists at the very last minute, and even when our gifts previously involved "every single toy in the JC Penny's catalogue." Of course, the pile of gifts under the tree has grown smaller as we grow larger, but it's still more than any two daughters could ever deserve - to say nothing of the year my mother hid iPods in the stockings, usually opened after my parents have opened their gifts, and generally filled with candy, soaps, and little trinkets. We've been spoiled Christmas after Christmas, and I could not be more grateful for all the happy memories that it has created for us. I also really love buying Christmas presents. It's been a bit of a trial the past few years, with less spending money than I'm used to, but I try to find something thoughtful whenever I can. 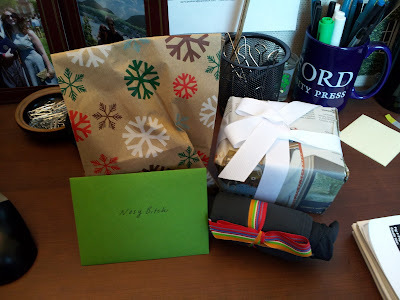 I can't spill any of the details here, in case a gift-receiver is reading this, but I hope everyone enjoys what I've given them, and I hope it's all a surprise. Also, this year, I received a wonderful gift from a twitter gift exchange. I love the little community that has built up around twitter and this blog, and I could not be happier to have received this wonderful little bundle from Meghan. She sent a winter care-package, filled with wonderful things to keep me warm: tights, tea, and the prettiest yarn you can imagine. It was the perfect package, filled with things I really need, and I was so glad to open it during a hectic day at work (and at the prodding of a friendly co-worker - the other thing about me and gifts is that I love to savor them, and so it takes me forever to open them.) Thanks so much, Meghan - it's all perfect!